For Duck football fans, it used to be about beating the Beavers and the Huskies. Then it moved on to being about winning the Pac-10/12. Now with a Heisman in the trophy case, there’s just one bridge to cross to garner total respect: a national championship. That brings up a new group of rivals, most notably Ohio State and the Southeast Conference (SEC), so it becomes more important to pay heed to what they are up to. The SEC just completed its media days with some surprises and non-surprises that are worth noting — and that is the subject of this week’s Three-and-Out. For some reason, people saw right through him. “Hurry-up” is here to stay, and Saban has found something new to whine about. This time, it’s the announcing of feedback from the NFL on ratings for players who are thinking about going “three-and-out” with college ball. The ratings came out around Christmas 2014, and all of a sudden Saban thinks it’s a terrible distraction, with a great implication that it’s what caused his team’s loss to Ohio State a week later. Yes, I expect to have the 2015 excuse ready by February, but we don’t like to rush things. How that works is anybody’s guess. It seems that a player who received high marks would get a bit of a charge out of it and want to show himself worth it in a major bowl game a week later. And a true competitor who got a low rating would develop a bit of an “I’ll show them” attitude. Alabama got left out in 2013 because the unwritten rule benders who were playing too fast obviously didn’t care about player safety. A year later, it’s because his players found out what the NFL thought of them a week before they lost to Ohio State. Makes you wonder what the downfall will be for 2015. 2. Surprisingly, a lack of hubris? ESPN staff writer Edward Aschoff, covering the SEC Media Days, noted a bit of a down tone in the SEC hubris department. That will happen when a conference fails to win two national championships in a row, but was the hubris ever warranted in the first place? SEC fans will gleefully point to the seven straight BCS championships between the 2006 and 2012 seasons, but really, the SEC’s dominance has been on the wane since Florida’s 41-14 win over Ohio State after the 2006 season. In 2007, LSU beat the Buckeyes by 14. In the next two years, Florida beat Oklahoma and Alabama beat Texas, but by just 10 each. And SEC fans would like to think that Auburn dominated Oregon in the 2010 season championship, but — reality check — it was only by a closing-seconds field goal. The next year featured an all-SEC hate-fest between Alabama and LSU, with the rest of the country watching “Murder, She Wrote” reruns. 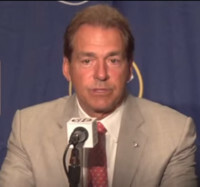 And after the 2012 season, Alabama dominated previously-undefeated Notre Dame, 42-14, but Notre Dame was possibly the worst undefeated team in the history of college football. So, yes, the SEC won seven straight BCS championships, but the handwriting that the rest of the country has been catching up has been on the wall since at least 2010. And for the past two years, the SEC has been breathing someone else’s dust. When Bielema’s wife doesn’t give him what he wants, he takes care of it himself. 3. 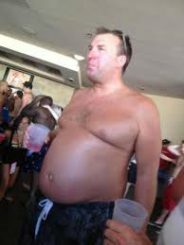 Bret Bielema. It turns out that Arkansas head coach Bret Bielema is a really, really good cook. This would not come as much of a surprise to anyone who has seen pictures of Bielema and Bielema’s wife. Jen Bielema is no salad dodger. Bielema apparently won his bride over with his cooking — it must have been on one of those rare salad days — and he apparently does some cooking for recruits. He may be on to something there. The first 2016 commit that Rivals.com lists for Arkansas is 6’4″, 306 lb. defensive tackle Austin Capps. Think about it, Coach Mark. Those big guys do like to eat. 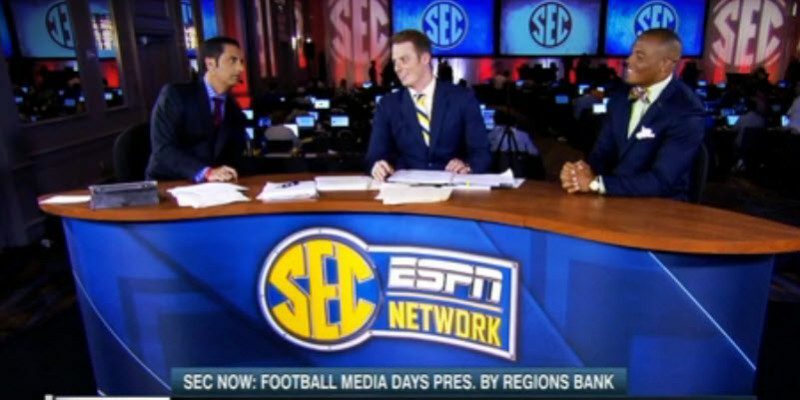 So, what is there to be learned from the SEC Media Days? Don’t whine when you lose. Don’t gloat when you win. And if you want to recruit the big guys, you’ve got to compete with Mom’s Home Cookin’.